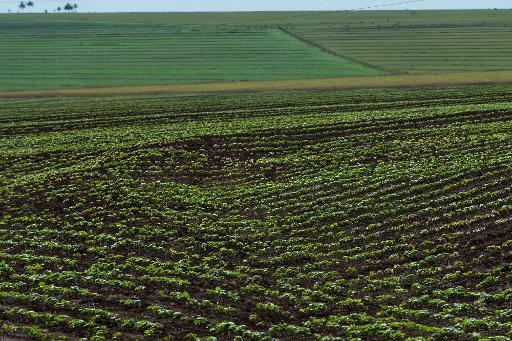 Brasília (AFP) – Hundreds of scientists are helping Brazil’s giant agricultural sector prepare for the effects of climate change and anticipate pests that hit neighboring countries. Spearheading the effort is the Brazilian Agriculture Research Corporation (Embrapa), a state agency tasked with developing and extending technology to support sustainable farming. “We have 400 investigators currently focusing on how to adapt our agriculture to climate change,” said Embrapa chief Mauricio Lopes. Brazil, South America’s biggest country in terms of size and population, has gradually emerged as an agricultural powerhouse. A net importer of farm products in the 1970s, it now ranks among the world’s five top agricultural producers and exporters and serves as a model for many developing countries. It ranks only second to the United States for biofuel production. Lopes said Embrapa is studying the effects of rising temperatures on crops “30, 40, 100 years” from now. “Where will we have to move coffee, sugarcane and corn production? We are carefully anticipating the potential impacts of climate change in areas where we are adapting the crops,” he said. This, he noted, includes sophisticated experiments to try to imitate the effects of rising greenhouse gases in the atmosphere and determine whether this will have a positive or negative impact on crops. Embrapa also seeks to foster sustainable farming through public programs of low carbon emissions. Agriculture, which represents 22 percent of GDP in the world’s seventh largest economy, is a major source of greenhouse gases. Embrapa also plays a major role in combating crop pests and diseases. It has identified 489 such pests which affect neighboring countries or trade partners and which could enter Brazil. Lopes said Embrapa researchers are therefore developing crop resistance and tolerance. “Even before the scourge enters the country, we have the solution,” said Embrapa researcher Marcio Elias Ferreira. The agency is trying to bar the entry of crop diseases such as the armyworm, a common pest of grass which entered the country in 2001 and spread nationwide. Embrapa is now focusing on a wheat pest that emerged in Africa five years ago, then moved into the Middle and is now in South America, although not yet in Brazil.